We had your party today. I think you would have liked it. I was worried there might not be many people, but I always underestimate country folk. There were your peeps and Dad’s peeps and school peeps and work peeps and peeps who I don’t know at all. Buddy Tom was there! I don’t think I’ve ever been so happy. He loved you a lot. But I’m sure you knew that. I know you would have been mad, but I sort of hid out on the outskirts so I didn’t have to talk with people. Did I ever mention I’m shy? But I did get caught by an elderly woman who said “Are you with the one with the frogs?” Mike said she has asked him the same thing and when he said no, she just walked away. Anyhow, she was the postmaster who took over for Granddad. We had a great time visiting, and I told her how Granddad would always tell me when she called him. “There’s a package here from Arizona!” she would say. “I bet I know what it is! I bet it’s a frog!” Then one of the Duseks came up, a frail, elderly woman with a cane. We talked about Vancourt and how the school house looks like it was just built yesterday and just what IS the deal with those nasty dogs. I told them about how we always played the “I see the gin” game as kids, and how Mo and I still play it now. For a minute, I started to think that visiting with people isn’t that bad. But I snapped out of it. Everyone held up pretty well. I guess we were pretty cried out after a long week. A woman sang Amazing Grace and How Great Thou Art, and June told the story about how you always piled us in the car to drive 20 miles to the grandparents’ house when a tornado was looming so that we could go to their storm shelter, even though that meant we more likely would be stranded in a car on a flat stretch of highway. Everyone laughed. Laughing felt good. We came home and had barbecue with Laura’s family. Then Anne (yes! she got to come home for a couple of days! ), Rick, Mo and I went over to Joyce Wilde’s joint. MO FINALLY BOUGHT COWBOY BOOTS!!!! You’d have been so proud of her. After all this time, she finally found the right pair. And just across the street from M.L. Leddy’s! I can almost hear a drawl in that girl. I think you may be channeling into her. 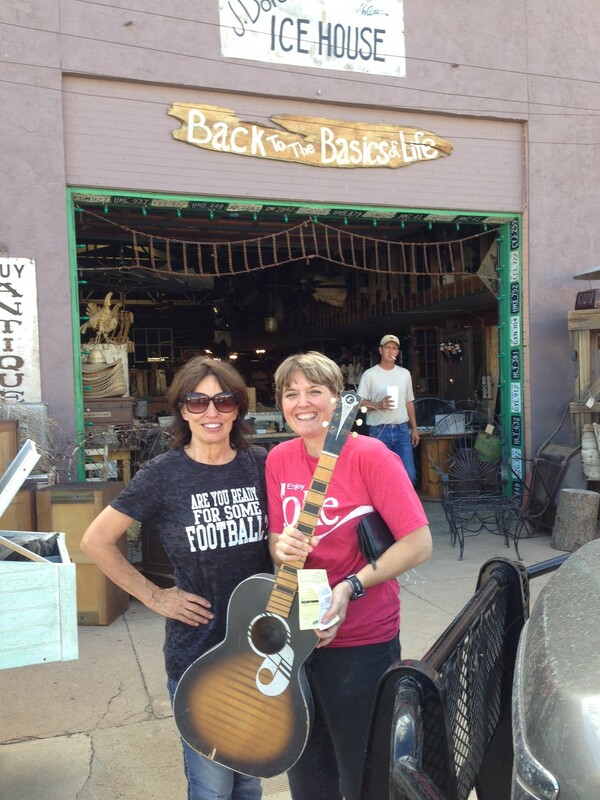 Joyce also sold her a Kay guitar. She pointed out that Elvis started out with a Kay guitar, and that Elvis played here when he was starting out. Therefore, she concluded it may or may not actually be Elvis’ first guitar. I’m guessing the $35 price tag shows which way she’s leaning on that one. It reminded me of the time when the girls at the bank wanted you to go to the Elvis show and you declined, thinking he would never be a big deal. That was a good story. I wish you could tell it one more time. We went to the pottery museum so our brains could shut down for a while, and then we came home. It was so sad, Ma. I wanted to come running in to tell you about Mo’s boots, but you weren’t there. But Dad was excited and showed her how to use a boot jack. She’s gonna be a cowboy yet. The fam watched the slide show of your photos about 200 times. Why had I never seen that picture of you as a teen in jeans? Everyone was completely stuffed and couldn’t eat one more bite, so we had another round of peach cobbler. With whipped cream. You’d have been impressed. We’re going back home tomorrow. Please watch over Dad. It’s hard for us, and I guess it’s multiplied by a million for him. But you know how stubborn he is. Maybe he’ll be OK just so we stop bugging him. I hope you’ve caught up with the relatives and John Wayne and everything is well. I miss you and I love you and my life will never be the same. Thanks again for being my mom. This entry was posted in margarine and tagged life. Bookmark the permalink. Hearts are bigger in Texas. GOD got himself another ANGEL! Sorry for your loss. Bawling like I was right there next to you and your Ma. I’m so sorry for your loss. Thank you for sharing something so personal and sharing it in way that us followers can feel. Wish I had met your Ma, but now I feel that I have. Much Love to you, your new Washingtonian – turned cowgirl wife and your family!! I like the idea of being a party. That’s how I would want it…complete with buffalo wings and beer. I LOVE How Great Thou Art. This really is truly beautiful. Thanks for sharing. Your mama raised you well. Oh, and Kynan is right. My heart just breaks for you and your family. Your posts in the last week have me laughing and crying at the same time. My thoughts are with you and your family. Hugs from Arizona. What a beautiful post. It brought tears. I am so sorry for the loss of your Ma. Much love and heartfelt thoughts to you and your family.